Here is an image provided courtesy of ResMed, that shows the scale of the AirMini. ResMed has recently released new information about a new product: the AirMini CPAP machine and an AirMini mask. ResMed is actually holding a drawing where you have the chance of winning the AirMini, click here for more information. ​While we wait for more information from ResMed, feel free to read our article about the current best travel CPAP machines. The popularity for mini CPAPs has increased significantly in recent years due to the technological improvements made by CPAP manufacturers. One of the better options right now that the ResMed AirMini is looking to overtake is the HDM Z1 CPAP. With a small form factor and integrated battery compartment, it is a fantastic all-in-one travel CPAP option. ResMed certainly has more of a market share in the CPAP industry, so it'll be interesting to see how well the AirMini can perform. How Small Is the ResMed AirMini? ​According to the giveaway details, prize winners will receive either the AirFit F20 mask, AirFit N20 mask, or an AirMini Mask Pack. From this information, it appears the AirMini will continue to use standard CPAP hose sizes so you can use your favorite CPAP mask (hint: ours is the AirFit N20). It will be interesting to see how they design the new AirMini​ mask to conform to a "travel size" while also being comfortable to use. You MUST have a current CPAP prescription as of 3/12/2017 ready to present if you are the grand final winner. Contest is only open to residents of the US and D.C.
A. If you have a mask that takes a standard sized hose, you will be able to continue to use it. We recommend the ResMed AirFit N20 mask as it is smaller than the full faced F20 mask. Q. Does it have a humidifier? A. From the information released so far, it does not appear to come with a humidifier option. In our opinion, this is completely fine as it makes it more mobile and travel friendly, and also easier to maintain. For those who absolutely must have a humidifier, there is a small CPAP machine called the Apex that offers an optional heated humidifier. Q. 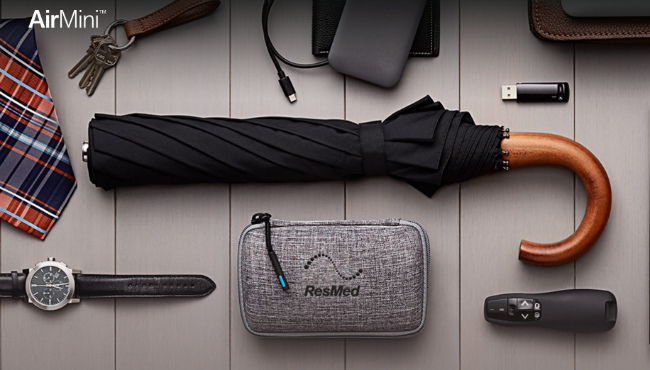 Can I go through airport security with the ResMed AirMini? A. Yes, you can take any CPAP machine with you through airport security. TSA is well aware of these machines by now and you are actually granted unique carry-on permissions if you choose to travel with a CPAP machine in a separate bag. For more information, you can read information directly from the TSA and traveling with a CPAP. Q. What is the price of the ResMed AirMini CPAP? We're interested in hearing your thoughts regarding this new mini CPAP machine. I'm personally excited as I do find it to be a bit cumbersome trying to travel with a full sized AirSense 10, but that's because I try to travel as light as possible. The size of the AirMini looks very promising and I certainly hope it can provide useful CPAP therapy for such a small device. What are your thoughts on this new product? Let us know in the comments! Every tool in your sleep apnea therapy arsenal has the potential to increase your success in treating your condition. Having the best CPAP pillow is just as important as having a great CPAP machine or the best CPAP mask. Keep reading to see our recommendations for the best CPAP pillows that will help you get a comfortable sleep. If your conventional pillow is pushing your mask off of your face, even a little bit, then you aren’t getting the proper therapy. That’s when it’s time to add a CPAP pillow to your repertoire in your battle against sleep apnea. Having all these great tools won’t do much if something as simple as your pillow is throwing a wrench in your therapy. If your pillow has been causing your mask to come off at night, or you tighten your mask too much to compensate and end up with sores on your face, then read on. Below is a review of the best CPAP pillows on the market. Whether you are a back sleeper, side sleeper, stomach sleeper, or all-over-the-place sleeper, you will find a recommended CPAP sleep pillow for your needs. So, you’ve got your CPAP machine and mask, you’ve begun therapy, and everything is going well, but you find yourself wondering how to clean your CPAP machine. In this article, I will cover several methods of cleaning your CPAP equipment along with what products work the best as a CPAP machine cleaner. But first, let’s clarify why cleaning and sanitizing your equipment is so important. What are nasal CPAP masks? They are the original sleep apnea CPAP mask. They are designed to only go over your nose, offering a less bulky feeling than a full-face CPAP mask. ResMed has been making the best nasal CPAP masks on the market for many years. They continued to improve their masks by releasing the Airfit N20 (check for prices on Amazon). In this ResMed Airfit N20 review, I will cover why this new nasal mask is worth buying. ResMed has innovated the nasal mask cushion with InfinitySeal technology. That helps the cushion conform and mold to the contours of your face. This allows the cushion to fit all shapes and sizes of noses comfortably. In this review of the AirFit N20 nasal CPAP mask, I will go over the features of this nasal mask and what makes it one of the best nasal CPAP masks on the market today. When the AirFit F10 was released, customers raved that it was the best full-face CPAP mask on the market. Well, the company outdid themselves this time by releasing the AirFit F20 (check for deals on Amazon). with a host of new features that will have you wondering how you lived without it. The AirFit F20 features a more comfortable fit, fewer leaks, quieter diffuser, quick release elbow, and magnetic clips to replace the old style clips. 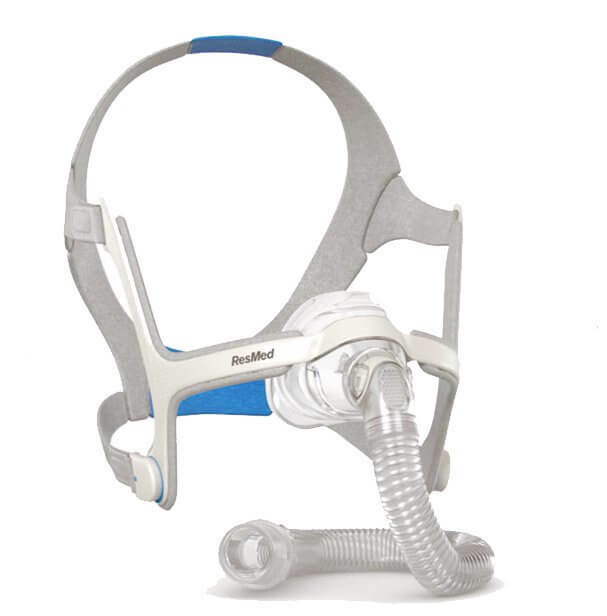 Read this ResMed AirFit F20 review and see if you think you should replace your old CPAP mask. Sleep. We spend a third of our entire lives sleeping. Yet it's possible your sleep is hurting your health due to sleep apnea. This article will explain the difference between sleep apnea and hypopnea, along with adverse events per hour that disrupt your sleep and your life. Sleep apnea and hypopnea are treatable, but first it's best to know what they are and how they affect you. This article will explain an apnea vs hyponea and what events per hour are. Sleep Apnea Machine – What Is It? Sleep apnea is an increasingly common sleep disorder affecting millions of people in the world. This condition either causes you to stop breathing during the night or causes very shallow breathing. Signs of sleep apnea include snoring loud, your breathing stops, or you choke as you are trying to inhale. This is a result of the relaxing of the muscles of the upper airway, especially if you sleep on your back. Obstructive sleep apnea may cause drowsiness throughout the day, high blood pressure, depression, pre-diabetes conditions, heart damage, and stroke. This is a very serious medical condition that needs to be treated in a timely manner. There are different ways to treat sleep apnea, including prescriptions, surgery, and sleep apnea machines. 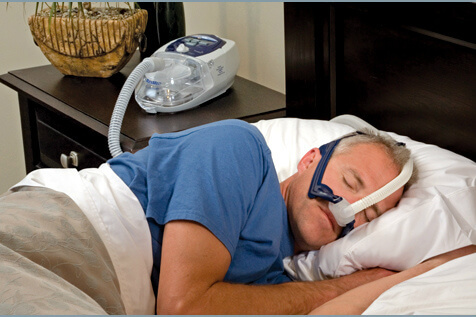 This article will explain what a sleep apnea machine is. With the increased prevalence of obstructive sleep apnea, many questions have arisen as to what is the best treatment. Most patients opt for the non-invasive treatment method of PAP (or Positive Airway Pressure) but the diagnosis doesn’t end there. There is a wide range of choices, from masks to machines, so which one is best? In this article, I will discuss the differences between a BiPAP vs CPAP machine. Even after getting the best CPAP machine and mask to treat your sleep apnea, you may still suffer from poor sleep due to one important issue, your CPAP hose getting in the way. Many people have problems with their hoses getting tangled when they move around at night. Another issue is getting the hose in just the right position to avoid it moving your mask. A tangled hose can cause your mask to come loose during the night causing air leaks which will affect your CPAP therapy. It can also blow air into your eyes making them swell (which is no fun.) In this review, I will help you find the best CPAP hose holder. CPAP hose covers have many uses all of which are beneficial for different reasons. Some of those reasons include stopping rainout, limiting noise, offering protection from pets, and others. In this guide, I will provide reviews on the best CPAP hose cover reviews that I believe will solve some of your problems.